Ah, the 90's are the gift that keeps on giving. From the music to the fashion to the tv and pop culture, it was just an interesting time all around. And in the fashion, lets not forget about the fiery looks that the decade spawned. Didn't matter if it was for work or play, or even for a wedding or other formal gatherings. Tammi herself looks incredible, of course, but what about those poor bridesmaids, wearing lace curtains even your grandma wouldn't hang? 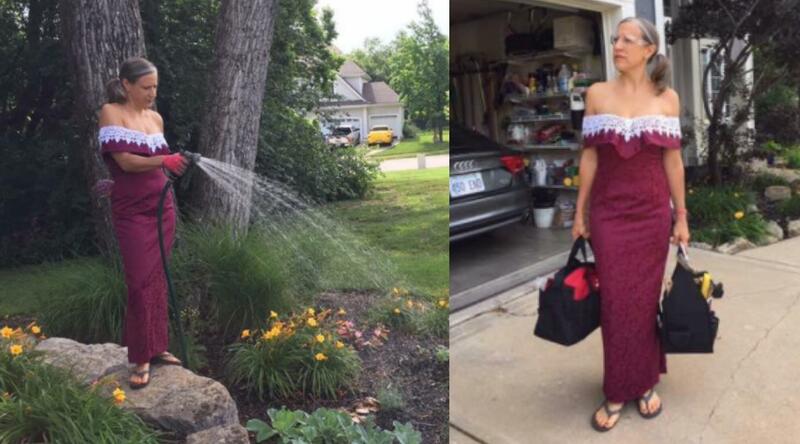 In the comments, Sauer's friend and former bridesmaid, Heidi Bruce Mann, posted the perfect anniversary gift: A photo shoot showing off all the use Mann has gotten out of that hideous dress over the years. 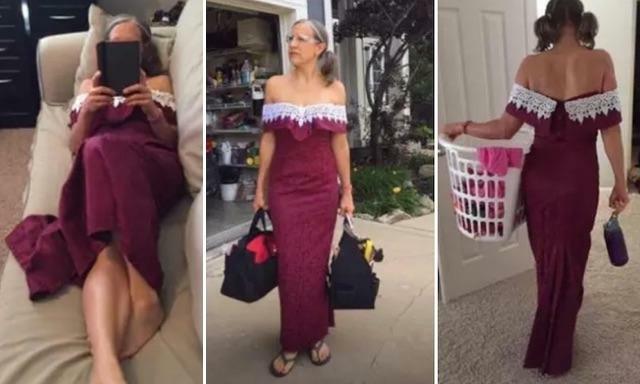 Is there anything you can't do in this dress? Mann told BuzzFeed that the shoot was her kid's idea and they helped her with the pics. And if you're wondering why she still even has this gown after twenty years, Mann says she actually has eight bridesmaids dresses tucked away. For an emergency, I assume. You never know when someone might want to get married and make sure they look better than everyone else at the altar. Mann says she did the same thing at her wedding, in fact. "The way Tammi was so apologetic made me think about how almost every person whose wedding I’d been in hoped I’d be able to wear their dress again," Mann said. "I don’t blame them…I did the same thing to my bridesmaids. I was certain I was getting them dresses that they would be able to wear again. I wasn’t."